Designer Timber Doors are distributors for Hume Doors, Corinthian Doors and Statesman Doors , all of which supply quality products. We also stock locks and hardware products supplied by Lockwood, Gainsborough, Lane and Ingersoll Rand, along with many other suppliers including Superior Brass and Delf Brass, all quality suppliers of door locks, fittings and general hardware. 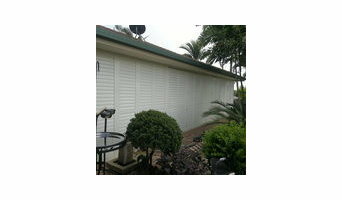 Designer Timber Doors is also well known locally for our quality internal and external blinds and shutters. We supply a free measure and quote service with fully trained staff available for installations if required. Find a Mackay, Queensland door professional on Houzz. Scroll through this page to find door professionals in your area. Look at project photos and read reviews to find out how homeowners rate their service, expertise and product.